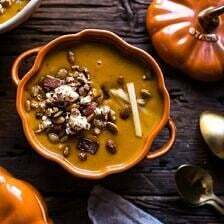 If there is one soup you need to make this November, it’s got to be this Cream of Pumpkin Soup with Maple Pecans. When I think of November, and certainly Thanksgiving, I think of two things, turkey and pumpkin. I know, so typical. But I recently learned I am no different from most when it comes to Thanksgiving, I love a traditional meal filled with classic turkey, plenty of sides, a creamy soup, and pie…of course. You see, I did a poll on Instagram stories the other week, asking whether a traditional Thanksgiving meal was preferred or something a little different…traditional won by a landslide. Currently, I am all about this pumpkin soup. It’s sweet, creamy, and topped with the most delicious maple pecans (possibly the best thing to ever be put on top of soup). 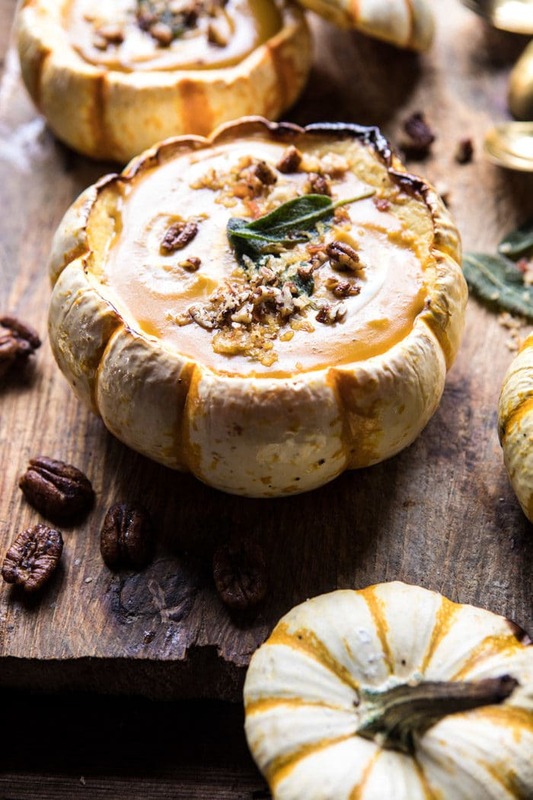 I served the pumpkin soup inside little roasted sugar pumpkins and the cuteness of this soup has me so excited. Hey, I always say, presentation is just as important as taste! The base of this pumpkin soup is very simple, but I did do something that might throw some of you off just a smidge. The recipe starts off by simmering some real maple syrup and a cinnamon stick together. 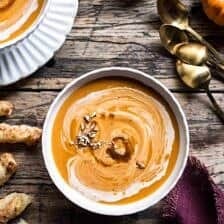 I know that using maple in a savory recipe like pumpkin soup may seem somewhat odd, but trust me, it makes for the most satisfying pumpkin soup. I’ve found that pumpkin soup can often be a bit bland. Adding in a little maple syrup and a touch of cinnamon brings out the sweetness in the pumpkin. And when paired with the cream? Well it all balances out and creates the best pumpkin soup. As you guys know, I’m all about toppings, but especially when it comes to a cream based soup, I just think they need a little texture and toppings are the way to go. The maple pecans that go atop this soup are everything. They complete the recipe, adding a final touch of sweetness and a nice crunch. I’m even more excited about the pecans because I used Diamond of California Heirloom Pecans. 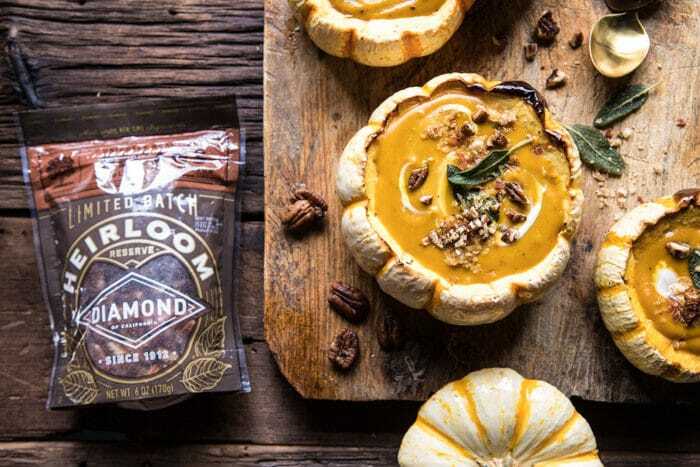 For the first time ever, Diamond of California is reviving a selection of increasingly rare varieties of nuts that existed long before the conventional growing methods that have dominated the agricultural industry. These heirloom varieties of nuts have been passed down over generations and possess naturally beautiful irregularities that boast enhanced flavor and distinct texture. 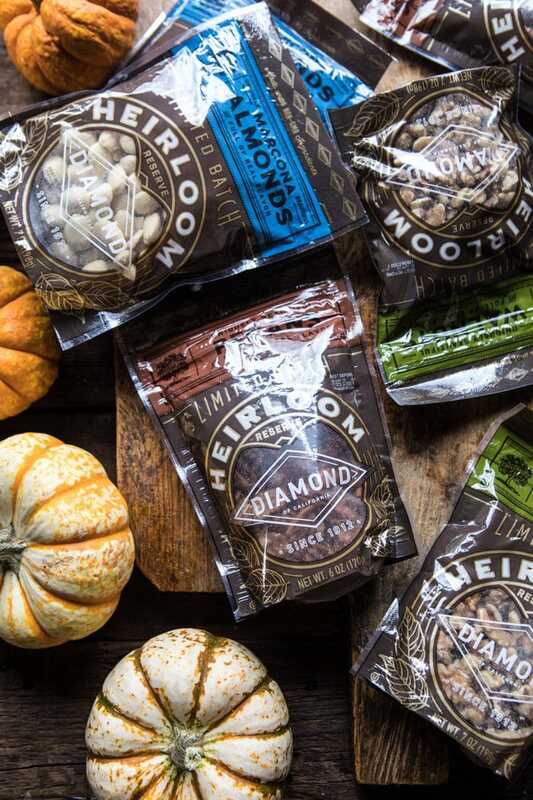 The heirloom nuts are made with non-GMO ingredients and are available this month in the produce section of various fine retailers as well as on Amazon.com. You guys, I can’t tell you how delicious these nuts are. The taste is not even comparable to your everyday grocery store nut. I can’t wait to use each variety for upcoming holiday baking (hello to my Pecan Pie Cupcakes and Baked Brie Bites with Honey Pears and Walnuts). And those marcona almonds? Totally putting those on my Harvest Cheese Board from the HBH cookbook. For more information on Diamond of California, follow along on Instagram and Facebook. If you plan to make this for your Thanksgiving table this year, here are a few tips. Roast the pumpkin bowls ahead of time, make the soup, then just warm both before serving. 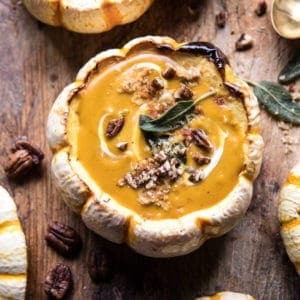 The roasted pumpkin bowls can be warmed in the oven, but they don’t need to be piping hot, as the soup will warm them up. You can also make the pecans and sourdough pangrattato a couple of days in advance to save time on Thanksgiving Day. And of course, if you want to make this completely vegetarian, you can omit the prosciutto. Not a huge deal at all, but I do love the salty flavor it adds. 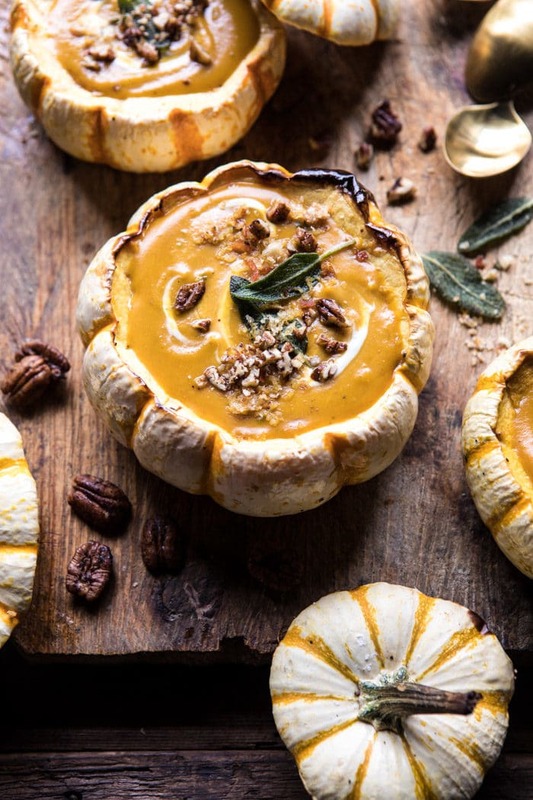 Sweet, creamy, and topped with the most delicious maple pecans (possibly the best thing to ever be put on top of soup) and served in roasted sugar pumpkins. 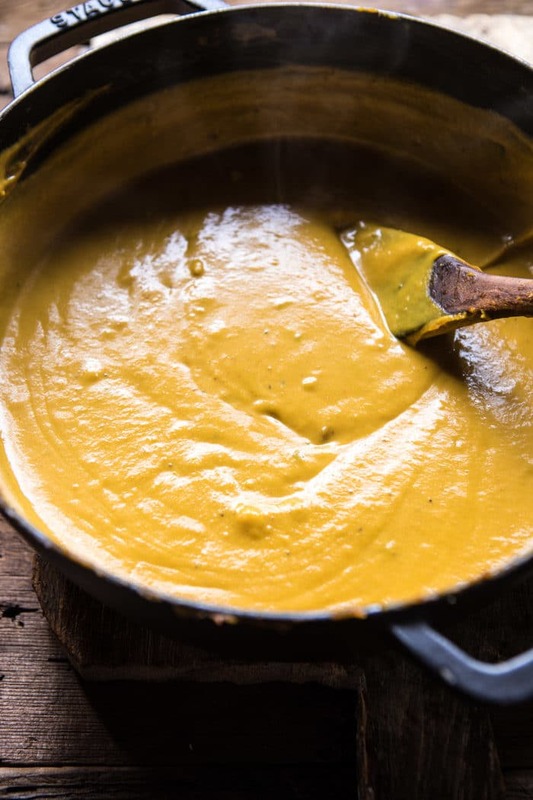 The perfect autumn soup! 1. Add 1/2 cup maple syrup and the cinnamon stick to a large soup pot, bring to a boil and then reduce the heat to a simmer, simmer for 5-10 minutes or until the maple has thickened and reduced to a syrup. Be careful not to let it get too thick, you just want it to thicken to a honey consistency. 2. Slowly stir the pumpkin puree into the thickened maple syrup. Add the broth, thyme, nutmeg, cayenne and a pinch each of salt and pepper. Cook over medium heat until warmed through, about 10 minutes. Stir in the bourbon, if using, and 1/2 cup cream. Continue to cook another 5 minutes. If desired, add the remaining cream for a creamier soup. If the soup seems too thick, add more broth to thin. Keep over low heat until ready to serve. Remove the cinnamon stick. 3. Meanwhile, make the pecans. Heat a large skillet over medium heat. Add the pecans, 2 tablespoons maple syrup, 2 tablespoons butter, and 1/4 teaspoon cinnamon. Cook, stirring often, until the pecans are toasted and golden, about 5-8 minutes. Remove the pecans from the pan to a parchment lined cutting board. Let cool and then roughly chop. 4. In the same skillet, cook the prosciutto until crisp. Remove and allow to cool, then add to a food processor along with the bread, process until fine crumbs. Add the remaining 2 tablespoons butter to the skillet. Allow the butter to brown lightly until it smells toasted, about 2 minutes. Add the bread crumbs and sage. Toast the mixture for about 5 minutes or until the bread crumbs are golden. Season with salt and pepper. 5. 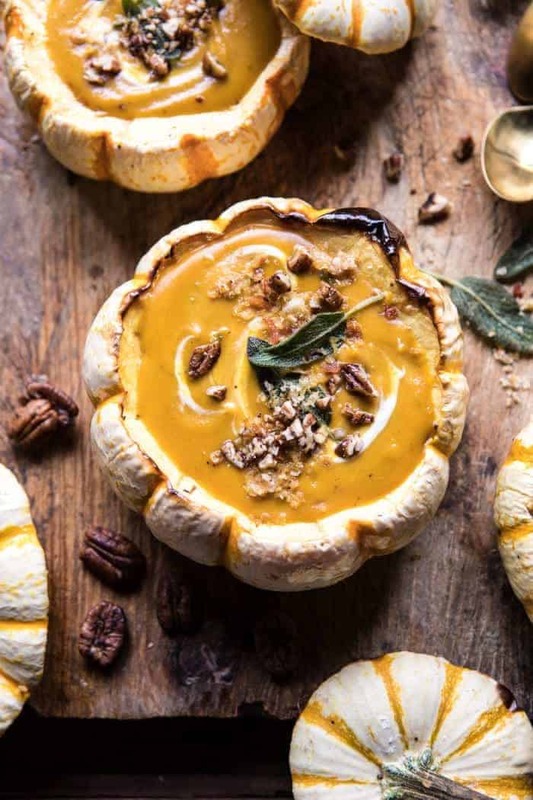 Divide the soup between the roasted pumpkin bowls (see below). Top with pecans, bread crumbs, and sage. Enjoy! 2. Remove the tops of the pumpkin and scoop out the seeds. 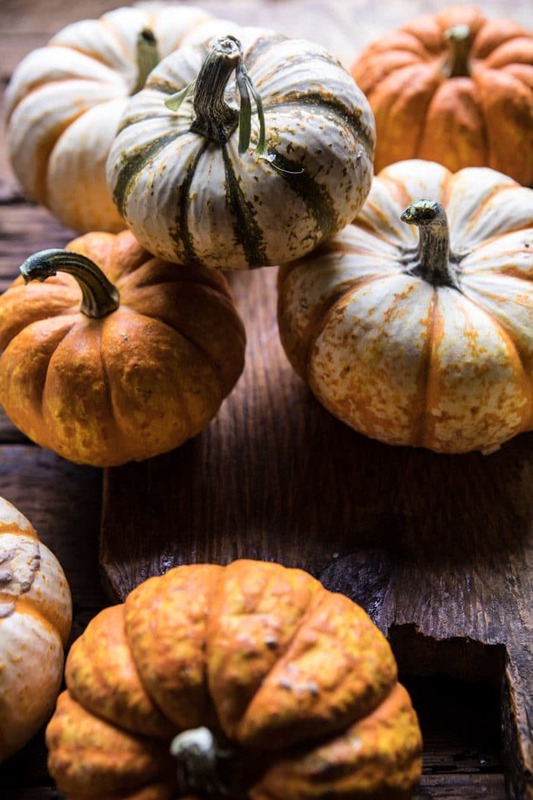 Rub the insides of the pumpkins with olive oil, salt, and pepper. Place on a baking sheet and bake for 20-30 minutes or just until soft to touch but not falling in. 3. Serve warm with soup inside. What is not optional? Those maple pecans, they truly complete this soup. No, adding maple syrup into the soup is not weird at all. And the cinnamon? I use it in every dish lately. Sweet, savoury, I really don’t care. Bucause it is amazing and it adds so much flavour. It is a fun way how to spice things up and make your table interesting. Plus, NO DISHES! You can eat whole your bowl! 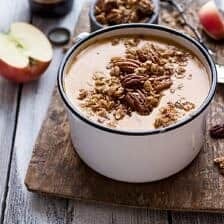 I love thick creamy soups (almost purees) so this is just made for me 😍😍 Also, I’m a huge nut lover and freak and way too much obsessed with nuts, so sometimes I regret not living in US where you can get all these goodies.. So glad you are loving this! Cinnamon is just one of the best spices! Also, loving your pumpkin bowls, they look so good! Thank you so much! Awwwww, no, I thank YOU! It really amazes me you find the time to really check my recipes, it means a WORLD to me! I love you so much Tiegh, you are awesome and this blog is perfect. You are so creative and tallented and I look forward to every single post. Absolutely love this recipe Tieghan! And yes, presentation is just as important as taste and you are an absolute master of presentation! Awh thank you so much Debs! I could not find the Diamond of California heirloom nuts on Amazon! Any chance you can provide the link? 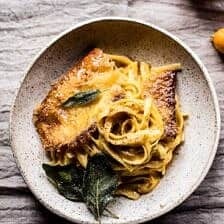 I love your cookbook and your recipe posts! The presentation here is stunning – it all looks amazing!! Looks delicious. Especially the heirloom nuts. I want those. I absolutely love nuts. YUM this looks delicious! Love the photography as well! When do you take out the cinnamon stick? Is it left in the whole time the soup is simmering? 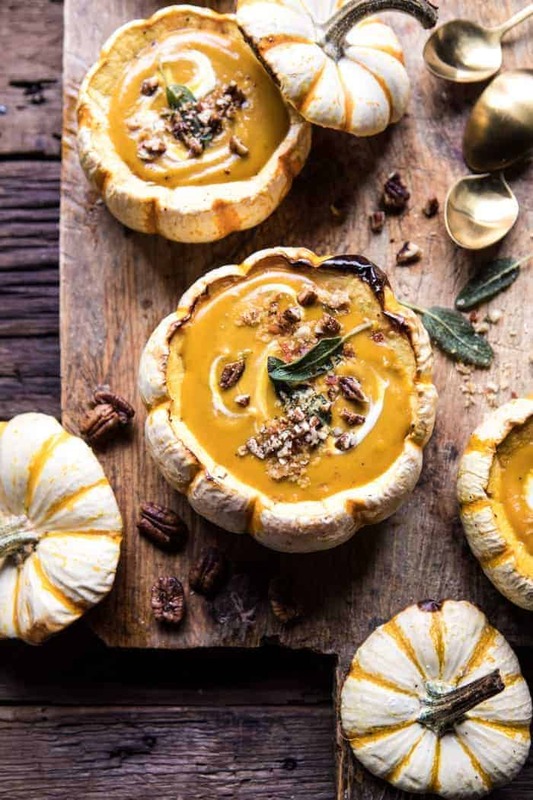 I just love the pumpkin bowls – this is beautiful! Hi- could I make this ahead of time? If so how long and what do you think the process would be? I made this soup for Thanksgiving and it was amazing! So good! MAPLE PECANS!!! What’s not to love? I am so happy you loved this! Thank you Carla! Hi, I love your recipes and beautiful pictures! I am a big fan of your sweet and savory recipes! For this soup, I am on a reflux diet and am not supposed to have high fat dairy products. Have you ever made this recipe, or how do you think it would taste if I used 1% milk? Or do you have another idea to give it the creamy flavor. Thanks! This looks delicious. I love your recipes and your photos. Beautiful! I’d love to make this but I am on a special diet to stop my reflux. I’m not supposed to have full fat dairy. What will be a good sub for the heavy cream and butter? You are such an amazing cook! I just made this and it is super easy and super yummy. I will definitely make this again. And also you are my favorite blogger. The recipes that you make are unbelievably delicious!!!! Isabella, this is so sweet! I am so glad you are loving my blog and recipe and I hope you continue to! Thank you! Have you ever tried this recipe with onion & bacon as well? I had dreams last night…..